I was fortunate to be the assistant of the late Prime Minister Vo Van Kiet from 1985 to 1994. He was a leader of strategic vision, determined to think and act in the cause of the country’s renovation and for the well-being of the people. He was realistic, close to the people, and kind to those around him. I write to share and record memories from when I worked with him. 1. 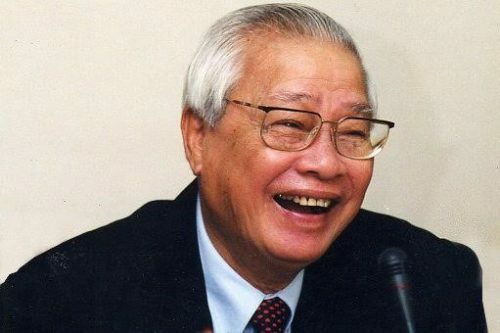 People still remember that after April 30, 1975, when the South was liberated and the country united, Vo Van Kiet was assigned to be the Chairman of the People’s Committee and then the Secretary of the Party Committee in Ho Chi Minh City. The city faced a lot of difficulties, including stagnate industrial production due to the lack of raw materials and poor agricultural production due to the unsuitable management mechanism. The State could not buy paddies, the people had to eat rice mixed with maize, potato, sweet potato, cassava, etc. Mr. Vo Van Kiet devised many measures to deal with the problems. For example, SOEs were allowed to borrow foreign currencies to buy raw materials, buy paddies from farmers at reasonable prices, etc., which was called “fence breaking.” It was contrary to the regulations of the State but solved practical issues and helped the people. The measures that he initiated in Ho Chi Minh City guided the entire country during the next few years. Mr. Vo Van Kiet was appointed as Deputy Chairman of the Council of Ministers in 1982, assumed the role of Acting Prime Minister from March to June 1988, took the role of First Vice Premier from June 1988 to August 1991 and then was elected as Prime Minister from 1991 to 1997. These were extremely difficult years. The country had to fight against the invasion in the Southwestern border conducted by the Khmer Rouge regime (1977-1989), followed by the war to protect the northern border against the Chinese invaders (1979-1989). This was the period of an economic embargo, exhausted raw materials, stagnate production, galloping inflation. People lived extremely difficult lives, as the economic and social crisis lasted for many years. Meanwhile, the country had just started the Renovation (Doi Moi). Innovative thinking was not common in the leadership, which was mired in bureaucratic central planning thinking. Given the complex situation of the country, the new vision and decisive character of Mr. Vo Van Kiet stood out. He was a strategic thinker, always looking to find breakthroughs that could promote the country’s development. He was not stuck in old ways of thinking. Under the direction and participation of Mr. Kiet, even in these difficult years, there were many breakthrough policies of “untying” thinking, granting the business rights to citizens and businesses. That was the abolition of the system of ordinance norms, granting business autonomy to state-owned enterprises; allowing big state-owned enterprises to import and export directly; abolishing goods circulation control stations on traffic routes, paving the way for free goods exchange throughout the country; allowing overseas Vietnamese to send and bring money to their home country, etc. Let’s talk more about two important laws: the Law on Private Enterprises and the Law on Joint Stock Companies (passed by the National Assembly in December 1990), which he directed. These two laws laid the foundations for the new private sector regulations in the 1992 Constitution (passed by the National Assembly in April 1992). At the same time, the State decided to abolish the food and foodstuff allowance for workers, civil servants, armed forces and urban population. Since 1989, prices have been set by the market. For farmers, the State removed the purchase of agricultural products at low set prices and bought agricultural products at negotiated rates. From 1990 to 1991, disorder in pricing and the distribution and circulation of goods ended, galloping inflation was reversed, and the economy gradually stabilized. I still remember the heated discussions at West Lake (Hanoi) in mid-1989 when he organized a banking reform research team including Professor Phan Van Tiem, Lam Vo Hoang, Huynh Buu Son, etc., that drafted two ordinances, transferring from one-level banks to two-level banks (Ordinance on the State Bank, the Central Bank and Ordinance on Banks, Credit Cooperatives and Financial Companies). This was a key innovation. It separated the function of regulating monetary policy of the Central Bank and the business function of commercial banks. Mr. Vo Van Kiet also advocated a number of other important projects such as the program of exploitation of Dong Thap Muoi and Long Xuyen Quadrangle; building a 500kV North-South Transmission Line, contributing to regulating the power volume throughout the country; building Bac Thang Long – Noi Bai route, expanding the gateway of Hanoi capital, etc. Let’s talk about his direction to exploit Dong Thap Muoi (including three provinces: Long An, Dong Thap and Tien Giang). This was a heavily saline alkaline-stricken area with annual flooding while the irrigation system there was almost zero. Rice was annually cultivated in Dong Thap Muoi in only one crop and in certain localities, rice yield was less than 1 ton/ha. He directly met farmers, came to each field, wading through the mud to ask farmers what should be done to improve production and then he made a breakthrough decision to build the irrigation system. At that time, there were dozens of meetings to get the opinions of scientists and managers, such as Prof. Vo Tong Xuan, an agricultural scientist of the Mekong River Delta, Mr. Nguyen Gioi and Mr. HO Chin, irrigation specialists, and local leaders such as Mr. Tu Than, Sau Binh, Tu Thanh, Muoi Nhe, Bay Phong, Chin Can, etc. As a result, paddy production in the Mekong River Delta was raised from 4.6 million tons in 1976 to 16.7 million tons in 2000; and the Mekong River Delta became the largest granary in Vietnam. The construction of the 500kV North-South Transmission Line is a testament to his strategic vision and assertiveness. In the face of objections, he wondered how to industrialize and modernize the country if power was not brought to the South. Once again, he gathered prestigious scientists to get their ideas of the best approach. They proposed “the guerrilla method”: divide the span into several sections, set the poles simultaneously, and then assemble the sections together. The 500 kV North-South Transmission Line was expected to take 4 years to build, but it was completed for two years. Other works such as building Bac Thang Long – Noi Bai route, expanding the gateway of Hanoi, building Yen Phu dike, etc. were also directed by Mr. Kiet. For a period after the Sixth National Congress of the Communist Party (December 1986), there was tension between the renovation and the old regime. Many feared that renovation would result in the loss of socialism. Mr. Vo Van Kiet made a great contribution to the persistence of the renovation policy, not only in the theory but through concrete activities based on practical evidence and expert advice, which “untied” the people to do business, thereby overcoming in part some of the shortcomings of the bureaucratic central planning regime. 2. Mr. Vo Van Kiet was dedicated to building a truly clean and strong Party that is worthy of the love and the trust of the people. He said that in the face of new situations and tasks, the Party could enhance its leadership by taking a pioneering role in advancing the interests of the nation. The political system, he believed, must be built on maximizing all resources of the nation for the purpose of developing and protecting the country. The Party needed to accept its historical responsibility, grasp the opportunity to unite the nation, and promote the strength of the nation to take advantage of opportunities. He believed special attention should be paid to the promotion of democracy within the Party. Democracy within the Party was, in his view, a prerequisite for drawing wisdom from the people, a “subsidy” that could propel the country forward. An event illustrates the strategic vision of Mr. Vo Van Kiet on the the issue of building the Party. In January 1994, the 7th mid-term National Party Conference of the Communist Party of Vietnam addressed four dangers: (i) being left behind economically by regional countries, (ii) breakdown of social order and security, (iii) corruption, (iv) peaceful evolution against socialism, particularly the danger of a breakdown of social order and security. This was a period in which the Party leaders had different views on major issues such as development strategies, international integration, normalization of relations with the United States, negotiations on WTO accession, etc. Mr. Vo Van Kiet wrote an important letter on August 9, 1995 to contribute his ideas in preparation for the 8th National Party Congress (July 1996). The letter outlined four important issues for the Politburo to consider: (i) A need to understand and be integrated into the world in which we are living, (ii) Concern about breakdown of social order and security, (iii) Improving the state management capacity, and (iv) Party reform. In his letter, he emphasized that in order to renovate the Party, the State must select the path of democracy to maximize the strength of the whole Vietnamese people. Special attention should be paid to raising the people’s knowledge, education, promotion and protection of citizens’ rights in order to promote the nation’s strength. Regarding the Party, he saw it necessary to reform the Party’s organizations and activities to overcome serious shortcomings. The principle of “centralized democracy,” he said, should be removed because it restricts Party members’ ability to speak out against abuses. Democracy needed to be promoted in the Party to ensure freedom of thought. For the work related to cadres, what he often wondered was how to identify talented individuals and place them in important positions of the Party and the Government. He argued that talent could only rise through democratic selection, even within the Party. If a ruling party did not reward talent, “the Party’s intellectual standards” would be lower than the people’s intellectual standards.” The Party would then be tempted to govern arbitrarily and corruption would almost certainly follow. And the Party would forfeit its chance to be a pioneering leader on behalf of the people. Mr. Vo Van Kiet emphasized the personal responsibility of the head of organizations as a way to overcome bureaucratic deficiencies. Responsible managers would not only limit the damage caused by corruption and waste but also increase the effectiveness of the law and the effectiveness of the Party’s efforts. At the first session of the 9th National Assembly (October 1992), after the list of new cabinet members was approved by the National Assembly, in his speech as Prime Minister, he emphasized personal responsibility, affirming that any member of the Government must resign or be dismissed if he/she failed to fulfill his/her duties or was involved in corruption, smuggling or other serious violation. Exchanging with the press later, he continued to say that a failure to demand personal responsibility was a major problem. Without a uniform demand of personal responsibility, people making serious mistakes will not be disciplined and will remain safe in office. Without an insistence on personal responsibility, the Government will not elevate the most talented and disciplined to positions of leadership. Mr. Vo Van Kiet repeatedly stressed that the strength of national unity, freedom, and democracy was the biggest and most valuable lesson in his revolutionary life. This was the source of the country’s successes from the earlies times. It was the way to win over the people’s’ heart for the cause of national reconstruction, the endless source of creative strength of the nation in the cause of industrialization and modernization. This idea was prominently displayed in his famous speech at the first overseas meeting during the New Year of Chicken (February 1993): “National consciousness and patriotism, unity, mobilization of all Vietnamese towards the goal meeting aspirations of the entire people which is to realize the prosperous people, the wealthy country, to advance to a modern society that is truly democratic, benevolent with culture and discipline, to abolish oppression and injustice, faciliating the people to have a good life, freedom and happiness. That goal harmoniously combines the interests of each person with the common interests of all people. Patriotism, solidarity, national harmony are the same heart, working together to achieve that goal, overcoming differences, including differences in the political view.” He emphasized that “even differences in the political view” by overseas Vietnamese were welcome. His thinking about national harmony and national reconciliation was very clear. In an interview with the press, he said: “The motherland is ours, the nation is ours, the country is ours; the motherland of Vietnam doesn’t belong to one person, one party or one group only”. Former Prime Minister Vo Van Kiet and Mr. Nguyen Anh Tuan, Director of Michael Dukakis Institute. Mr. Vo Van Kiet was a leader who sought new ways of doing things and did not depend on dogmatic theories. He did not speak or write by substituting “slogans” for thought. The policies he initiated and directed were rooted in research combined with experts’ advice. At the time, northern researchers used the words of Marx or Lenin to prove their argument. I also had that habit. He told me that he liked theories but they must be based on the reality. Marx and Lenin lived years ago in the West, so their theories might not fit the reality of our country. He studied our country’s reality, so that the policies he adopted applied to the reality of our lives. At the same time, he told us to always monitor, observe the situation of countries in the region, especially those who share the same situation with our country, try to learn from what works for them. Perhaps because of this reason, while visiting and working abroad, with modest attitude, humility, and a desire to learn, Mr. Kiet was honored by foreign leaders, even though our country had not yet opened itself fully to other countires. Given his respect for evidence, when he was appointed as the Chairman of the State Planning Commission in 1982, he spent a year traveling to provinces, districts, even communes and cooperatives in the North and the Central to learn from their ideas and experiences. His work was assigned to the Standing Vice Chairman. He then spent a day introducing to the key ministries of the State Planning Commission the results of his survey. He pointed out the shortcomings of the bureaucratic central planning regime, where norms were imposed by higher levels, forcing subordinates to perform mechanically, resulting in fake achievements. More importantly, the regime eliminate initiative and creativity from the people. He proposed a number of measures to reform the planning process, for example, the use of evidence and respect for the creativity of the people. A virtue of Mr. Vo Van Kiet was “listening.” He was one of those rare leaders who are close to the people and beloved by them. This was because he was a resilient soldier, always struggling for the renovation for the sake of the country and the people. As well, during his life, he was always close to the people, listening to the voice of many classes with the kindness that they saw in him and that he saw in them. He understood the difficulties of the people, listening to their opinions, “living in the heart of the people.” The policies he pursued were developed with people’s interests in mind, and they loved him as a result. Mr. Vo Van Kiet respected intellectuals and sought out their views. He said that the greatest of all resources was the human resource. If human power was gathered, all other resources could be gathered; if human power was not gathered, all other resources would pale. He said that in today’s world intellectuals are society’s leading resource. In seeking to develop a country, it is impossible to rely solely on enthusiasm and will. No leader can understand every economic, cultural, scientific and technical issue. They must rely on experts, which requires involving them in tasks where what they know is invaluable. A leader is not just someone who can win over the people. A leader must also be able to recognize intellectual talent and how to use it effectively. For that reason, Mr. Vo Van Kiet established consulting organizations. During his tenure as a leader in Ho Chi Minh City, he and the City’s Party Committee established in 1980 a Club of Directors, consisting of several directors, party secretaries, and secretaries of trade unions of state-owned enterprises chaired by Mr. Vo Thanh Cong, a member of the Standing Committee of the City. This club contributed many recommendations, everythng from the practices of the establishment to the formation of policies on management innovation in the city’s state-owned enterprises. Then, in 1976, while being the Secretary of the Party Committee in Ho Chi Minh City, he established the Economic Office of the Secretary of the City’s Party Committee, consisting of economists trained in the socialist regime and experts who worked in the former Saigon administration, led by Dr. Nguyen Xuan Oanh, who was a former Governor of the Bank, Deputy Prime Minister and Acting Prime Minister of the Republic of Vietnam. This office provided many recommendations on the city’s economic, industrial, financial and monetary strategy in the early years of liberation. 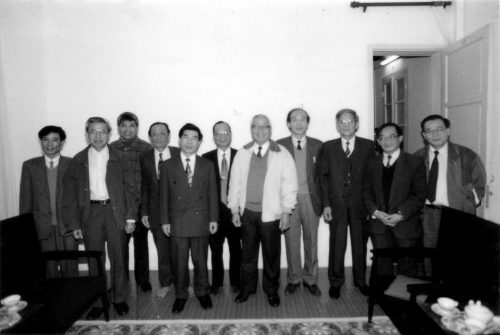 In 1985, in Ho Chi Minh City, the “Friday Group” was formed (this group was named because the group often met every Friday), including economists such as Phan Chanh Duong, Lam Vo Hoang, Phan Tuong Van, Tran Ba ​​Tuoc, Huynh Buu Son, etc. who were enthusiastic and qualified and had held high positions in the Republic of Vietnam. This group was commissioned to study many subjects, including price-wage-money reform. From the time he left Ho Chi Minh to come to the Central (in 1982), he continued to meet and exchange ideas with the above-mentioned organizations whenever he worked in Ho Chi Minh City; he also sent me as an Assistant to meetings to convey his requests and report back to him the findings and recommendations of these organizations. Let me discuss the “Consultative Group for Economic Reform and Public Administration Reform” (referred to as the Consultative Group for Reform) that was established in 1993 by Prime Minister Vo Van Kiet. It was a direct consulting organization that assisted the Prime Minister in planning reform programs for each period, in recommending policies and guidelines in the spirit of renovation, and participating in drafting or reviewing legal documents on reform. The Consultative Group for Reform was chaired by Minister Le Xuan Trinh, Chairman of the Office of the Government, along with many experts, mostly intellectuals in economics and law, including economic professors and doctors living and working abroad, namely United Nations statistical expert Vu Quang Viet in the United States, banking expert Tran Quoc Hung in Germany and economic Prof. Tran Van Tho in Japan. After three years of operation, in 1996, the Consultative Group for Reform was reformulated as the “Research Group for Economic, Social and Administrative Reform” in order to streamline the organization and improve its operational efficiency. At this time, the group was also given the task of editing documents at the request of the Prime Minister, mainly the reports and proposals presented by the Prime Minister to the National Assembly, the Central Committee of the Party, and the Politburo. Two years later (1998), the organization was upgraded to be “the Research Board of the Prime Minister” by Prime Minister Phan Van Khai with the right to be more active in terms of personnel, funding and cooperation with domestic research organizations and experts or foreign agencies and experts. In July 2006, the Research Board was dissolved. At many meetings with the above-mentioned consulting organizations that I attended, Mr. Vo Van Kiet listened to them closely and took detailed notes. He asked for explanations of things he did not know or understand, questioned opintions he found unsatisfactory, and instructed those who lacked information. He liked to work with people who offered opposing opinions. His openness appealed to intellectuals, not just those in the state apparatus but those who had high positions in the Republic of Vietnam or worked outside the country. They trusted him and therefore gave him their heartfelt views rather than saying what they thought he might want to hear. Mr. Vo Van Kiet was also very open with artists, writers and journalists. I attended some of the meetings, talking intimately with writer Nguyen Quang Sang, poet Nguyen Duy, musician Trinh Cong Son, journalist Thai Duy, etc. They were a channel through which he could hear about the concerns of artists and the people. They also met over drinks with him and his close friends. He inspired their art during difficult years of crisis. I listened to a poem that the poet Nguyen Duy “boldly read” for him in which there were quite heavy criticisms. He was very moved, saying this is the truth, faults of our regime that we must admit. He often reminded me to keep close relations with the press, inform reporters about the activities of the Government, and provide reporters timely feedback on public opinion. He often said that the press must be the voice of the people, especially the attitude of the people towards the policies and guidelines of the the Party and the State. Mr. Vo Van Kiet also made me deeply aware of his special trust in the young. In 1977 when Ho Chi Minh City was just liberated, his insightful statement, “No one can select their parents” helped the younger generation of the city to realize their future because many young people suffered from stigma or discrimination owing to family involvement in the Republic Vietnam. His statement prompted thousands of young people to plunge into rebuilding the city. Many brothers in Ho Chi Minh City told me the passionate atmosphere of the youth of the City when the Secretary of the Party Committee Vo Van Kiet launched the movement “the Youth volunteers to overcome the consequences of the war, building the wealthy country” in March 1976. They volunteered to go to the irrigation works and new economic zones such as Le Minh Xuan, Pham Van Hai, and Pham Van Coi. At that time, he encouraged them very practically and also very emotionally: “No young people can’t be moved by the song’s sentence “If you are human, I will die for the country.” Today’s hometown, he said, does not require every young person to die for it. Rather it requires him or her to live and live meaningfully. That sentence should be corrected as “If I am a man, I have to live for the homeland.” Living is not parasitic, living is to work”. At the time of constructing the 500kV North-South Transmission Line, Mr. Vo Van Kiet put his trust in the youth. Not only on the whole line, the young people were the main force in the construction of electric poles, pulling wire, etc. Many sections were assigned to the Ho Chi Minh Communist Youth Union or the Da Nang Youth Volunteers Association. I remembered very well the days when he and I climbed to the high mountain peaks to inspect the construction of electric poles and pulling of the wires. The young people gathered around “uncle Sau” like a family member. During a visit to the people constructing the Line on occasion of the Lunar New Year, he kindly talked with every person, asking them about their family, about the food and drinking water, reminding them of the cakes on Tet holiday. They cheered him. He regularly assigned me to contact the Central Committee of the Ho Chi Minh Communist Youth Union and hold meetings with the Ho Chi Minh Communist Youth Union for him. I was there to advance his ideas, especially those relating to the ideal education of the young. In those years, he officially assigned the Central Committee of the Ho Chi Minh Communist Youth Union to implement the Rural Water Supply and Sanitation Program. He also applauded the establishment of the Young Talent Fund, which was proposed by the Central Committee of the Ho Chi Minh Communist Youth Union. He accepted the position of Honorary President. Prime Minister Vo Van Kiet and his advisers, including Mr. Vu Quoc Tuan (standing on the right). 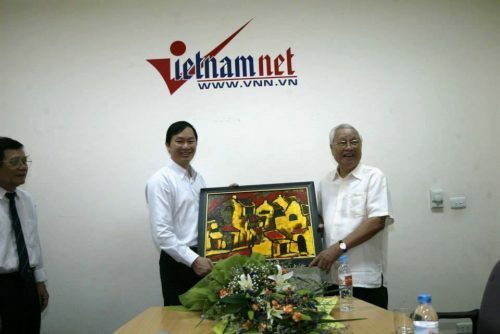 After the end of his tenure of the Prime Minister, Mr. Vo Van Kiet was invited to be an Advisor to the Central Committee of the Communist Party of Vietnam from December 1997 until April 2001. From then until the end of his life, he continued to visit localities, conduct surveys, meet experts (including experts in the Prime Minister’s Research Board), and contribute ideas to the Party and the Government in the fields of economy, society, foreign affairs, and especially on the adjustment and renovation of the Party. He fell ill and died (June 11, 2008) while preparing to go to the Netherlands to learn how flood control measures could be applied to the Mekong River Delta. There is a need today for outstanding leaders like the late Prime Minister Vo Van Kiet. Vietnam is at a fundamental turning point in its economic development and economic integration. The country needs strategic leaders like Vo Van Kiet who dare to speak honestly and act assertively, not to promote themselves but to promote the prosperity of the nation and the happiness of the people.